Until very recently, I hadn’t heard of the term “push present”. Who the hell came up with that name anyway? A friend gave birth and explained that she on that occasion received a diamond ring from the father. Hmm, should I now feel cheated? I didn’t get a present in the delivery room – other than my amazing children of course. A push gift is a gift which traditionally is given from father to mother in recognition of her hard work during pregnancy and childbirth. I don’t think anyone knows the origin of the tradition but it wouldn’t surprise me, if the jewelry industry has had a hand in it, since the package often contains diamonds. Apparently push presents are mainly for the wealthy, but when I told O about the tradition, he went and bought a late present for me. 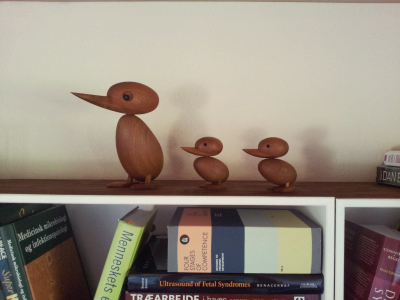 Not diamonds or a fancy car, but these wooden ducks designed by Hans Boelling, who got the inspiration by watching a police officer guide a duck and her ducklings safely across the road. Did you get a push present and what do you think about the concept?